Apparently Frito Lay was running a contest asking for new flavor suggestions and Southern Biscuits and Gravy made the top four. Do they taste like biscuits and gravy? A little… sort of… maybe… if you threw in some potatoes. Which isn't a bad thing to do with actual biscuits and gravy so I'll take it. Beggars can't be choosers, after all. 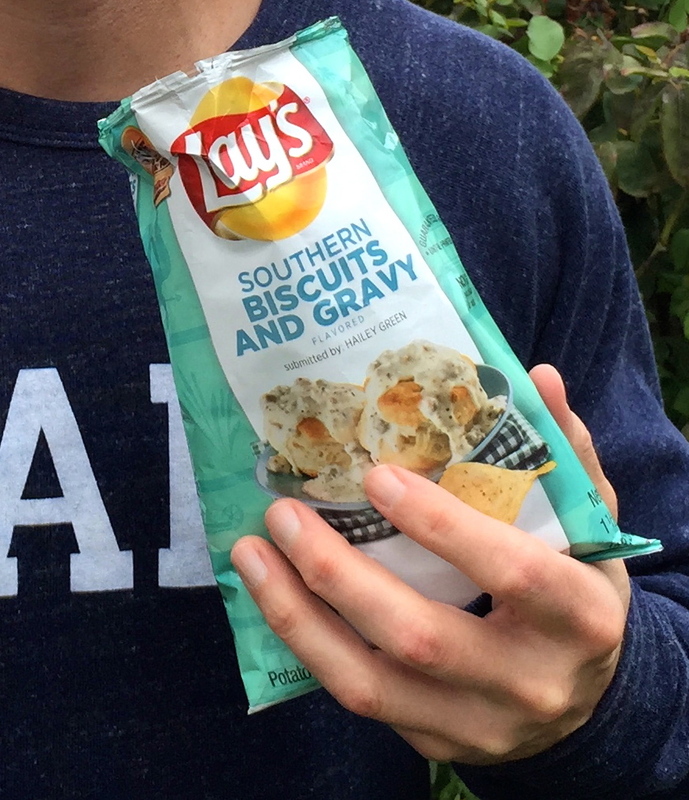 And like the old saying goes, "In the land of no biscuits and gravy the biscuits and gravy potato chip is king." So I decided to enjoy my biscuits and gravy outside on a rare So. Cal. cloudy, rainy (man, I miss rain) autumn-like day while wearing my new "Y'All" sweatshirt from Kentucky for Kentucky. Now if I could just cut down that palm tree looming over my shoulder it would feel almost like home. Kind of.